Work is currently being carried out following an up to date survey of the crags in the area to prioritize treatment. A programme of repairs will continue until all the major outcrops are treated. Once that is achieved, an annual inspection and maintenance schedule will be put in place. 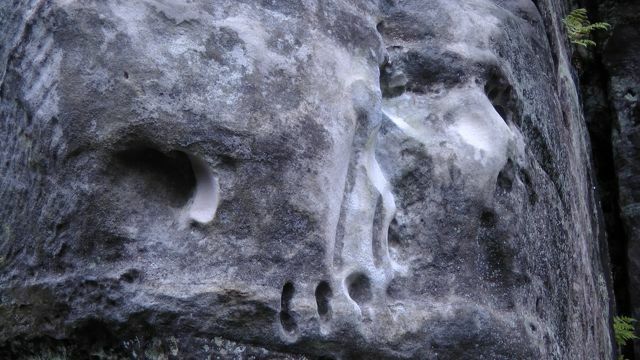 The sandstone outcrops of the Weald, and in particular Bowles, Harrison’s and Stone Farm Rocks, are amongst the most popular crags in the country. This popularity has led to a severe deterioration of the fabric of the cliffs. The main reason for this is the composition of the rock, which is, with the exception of the neighbouring chalk sea-cliffs, the softest to be climbed on in Britain. Geologically the rock belongs to the Lower Tunbridge Wells Sand Formation, and was laid down about 130 million years ago as part of a sequence of ancient river sediments. It is exceptionally weak, and owes almost all its strength to a thin weathered crust, typically only two to three millimetres thick. This crust took thousands of years to form, in a process where pore waters, containing minute amounts of dissolved silica, bonded the sand grains together. Unfortunately, and not surprisingly, this crust is easily destroyed, and has proven to be no match for the countless thousands of scrabbling feet that pass over it each year. Once destroyed, unconsolidated sand is exposed, and the cliff rapidly erodes. It was once thought that nothing could be done to halt this process. Climbers came to accept that climbs would change from year to year as holds disappeared, until finally they became unclimbable. An attempt was made in the early 1960s to repair damaged rock using cement, but it was done on a limited scale and only used to rebuild specific well-defined holds. The process would probably have been of no use when applied to large areas of rock, as well as being environmentally and aesthetically unacceptable. However cement was then used to fill in rope grooves. The solution emerged in the late 1980s when Gary Wickham, a leading sandstone climber, treated an area of badly damaged holds at High Rocks. On returning a few days later he found that the substance used had soaked into the rock and then set hard. The crust had been restored, and proved to be even harder than the surrounding, undamaged rock. More trials were carried out, and when it seemed that there were no adverse side effects, the substance was applied systematically to whole outcrops. During the course of the 1990s, Bowles, Harrison’s and Stone Farm Rocks were completely repaired, along with approximately a third of High Rocks, and small areas at other outcrops. Until recently this work has continued under Mike Vetterlein and is now being undertaken by Steve Jackson and Michael Phelan. It would be of great use to the SVG to know about any climb or area of rock that you feel needs attention. This will enable a log of all treatment to be kept to avoid duplication by individual climbers who may not be aware of plans to treat specific areas of rock and apply their own.